On behalf of Blue Pacific Solar Products, Inc.® dba Blue Pacific Solar® (referred to as "Blue Pacific Solar®," "us" or "we"), welcome to BluePacificSolar.com (hereinafter, the "Site" or "Web Site"). Blue Pacific Solar Products Inc., a California Corporation "BluePacificSolar.com" or "us" or "we" or "the company"), provides www.BluePacificSolar.com (the "Site") which offers world-class solar solutions, including but not limited to grid-tie solar power systems, hybrid solar wind systems, off-grid energy kits and backup applications (collectively referred to as "Offerings, Products or Kits"), subject to your compliance with the following Terms and Conditions of Use ("Terms"), as well as any other written agreement(s) between us and you (referred to "you" or "buyer" or "purchaser" or "web site user". On behalf of Blue Pacific Solar Products, Inc.® (referred to as "Blue Pacific Solar®," "us" or "we"), welcome to BluePacificSolar.com (hereinafter, the "Site"). We recognize that your privacy is important. This Policy discloses the privacy practices for the Site, and also covers how personal and other information that we receive or collect about you is treated. Please read the information below to learn the following regarding your use of the Site. If you have any questions about this Policy, please feel free to contact us by e-mail at CustService@BluePacificSolar.com. IMPORTANT: BY USING THE SITE AND/OR Offerings, Products or Kits AVAILABLE ON THIS SITE, YOU GIVE YOUR CONSENT THAT ALL PERSONAL DATA THAT YOU SUBMIT MAY BE PROCESSED BY US IN THE MANNER AND FOR THE PURPOSES DESCRIBED BELOW. IF YOU DO NOT AGREE TO THESE TERMS AND CONDITIONS, DO NOT USE THE SITE. Personally Identifiable Information (“PII”): This refers to information that lets us know the specifics of who you are. Examples of PII may include your first and last name, mailing address, email address and telephone number. You may also voluntarily provide other PII, whether or not specifically requested by us, by either voluntarily supplying your own details to us via e-mail or phone, or by posting publically viewable comments on the Site. You agree that we may collect any PII voluntarily supplied by you, whether or not we have requested it. You must not submit any PII relating to a third party which you do have permission from such third party to provide to us. We do not knowingly collect any information relating to third parties which you do not have permission to provide. When you engage in certain activities on our Site, such as purchasing a product or contacting us via e-mail or phone, we will ask you to provide certain PII. We do not collect any PII about you unless you voluntarily provide it to us. However, you may be required to provide certain PII to us when you elect to purchase products or use certain services available on the Site. We will not sell, trade or rent your PII to others. We do provide some of our service Offerings, Products or Kits through contractual arrangements made with affiliates, service providers, partners and other third parties ("Service Partners"). We and our Service Partners may need to use some PII in order to perform tasks between our respective sites, or to deliver services to you. For example, we may use Service Partners to assist us in delivering electronic newsletters and communications to you; delivering products to you; to collect PII voluntarily submitted by you when leaving comments on the Site; and to analyze Aggregate Information. We believe you should have the ability to access and edit the PII that you have provided to us. You may change any of your PII in your account online at any time by e-mailing us at CustService@BluePacificSolar.com. Upon your request, California Civil Code Section 1798.83, known as the "Shine the Light" law, requires us to provide to you (a) a list of your personal information, if any, which we have disclosed to third parties for direct marketing purposes in the preceding calendar year, and (b) the names and addresses of those third parties. You may make such a request once per calendar year, and we will provide the information to you free of charge. Please send any requests made pursuant to this section to us by e-mail at CustService@BluePacificSolar.com. However, as defined under Section 1798.83, we do not currently share any personal information with third parties for their direct marketing purposes. We may, from time to time, send you e-mails and/or newsletters regarding information, products or services that we feel may interest you. Only Blue Pacific Solar® (or agents working on behalf of Blue Pacific Solar® and under confidentiality agreements) will send you these notifications. If you do not want to receive correspondence from us, you can "opt-out" by clicking on the "Unsubscribe" link at the bottom of each correspondence. 1. Acceptance of Terms. All purchases through our site or other transactions for the sale of goods or services and or authorizing any charge to the buyer’s credit card or other payment form constitutes an acknowledgement and acceptance of the terms and conditions of the sale of products set forth here and in Blue Pacific Solar compete terms and conditions. The Buyer agrees that all orders or purchases made by the Buyer for products are subject to these Terms and Conditions of Sale set forth herein. 1.1 Blue Pacific Solar® Products, a California Corporation (referred to as "Blue Pacific Solar®," "BluePacificSolar.com" or "us" or "we"), provides www.BluePacificSolar.com (Collectively Referred to as the "Site or Website") which offers world-class solar solutions, including but not limited to grid-tie solar power systems, hybrid solar wind systems, off-grid energy kits and backup applications (collectively referred to as "Offerings, Products or Kits"), subject to your compliance with the following Terms and Conditions of Use ("Terms"), company policies as well as any other written agreement(s) between us and you. 1.2	We reserve the right to change these Terms and Conditions of Use from time to time with or without notice to you. You acknowledge and agree that it is your responsibility to periodically review this website and these Terms. Your continued use of this Website and Offerings, Products or Kits after such modifications will constitute acknowledgement and acceptance of the modified Terms. 1.3	As used in these Terms, references to our "Affiliates" include our owners, licensees, assigns, subsidiaries, affiliated companies, officers, directors, suppliers, partners, sponsors, and includes (without limitation) all parties involved in creating, producing, and/or delivering this Website, products and Offerings, Products or Kits available on this Website. 1.4	BY USING THIS SITE OR WEBSITE AND OFFERINGS, PRODUCTS OR KITS ON THIS SITE, YOU (COLLECTIVELY REFERRED TO AS "YOU" "BUYER" "CUSTOMER") AGREE TO BE BOUND BY THESE TERMS, CONDITIONS AND POLICIES. IF YOU DO NOT WISH TO BE BOUND BY THE THESE TERMS, CONDITIONS AND POLICIES, PLEASE EXIT THE SITE. YOUR SOLE REMEDY FOR DISSATISFACTION WITH THIS SITE OR OFFERINGS, PRODUCTS OR KITS AVAILABLE ON THIS SITE, OR THESE TERMS AND CONDITIONS AND OR POLICIES IS TO CEASE USING THE SITE AND/OR THOSE PARTICULAR OFFERINGS, PRODUCTS OR KITS. 2.1	Offerings, Products or Kits. Blue Pacific Solar® provides a number of Offerings, Products or Kits for users on its Site, including, but not limited to, allowing users to purchase do-it-yourself grid-tie solar power systems, hybrid solar wind systems, off-grid energy kits, equipment, parts and backup applications for the purpose of creating their own energy. 2.2	No Guarantee. Although Blue Pacific Solar® works hard to provide quality Offerings, Products or Kits, you understand and acknowledge that we cannot promise or guarantee specific results from using the Site or Offerings, Products or Kits available on this Site. 2.3 Terms and Conditions of Sale. Please refer to our Terms and Conditions of Sale for the policies applicable to your ordering and purchasing of products from BluePacificSolar.com as well as returns, exchanges and shipping of goods ordered from BluePacificSolar.com. Our Terms and Conditions of Sale applies to all purchases or orders made as a result of using the Site as well as any other written agreement(s), written quotes, written custom orders between us and you, and by ordering or purchasing products through the Site, as well as any other written agreement(s) between us and you, you acknowledge and agree to the policies contained in the Terms and Conditions of Sale. Please review our Terms and Conditions of Sale for any changes before any purchase as we reserve the right to make changes to it at any time. If you have any questions regarding our Terms and Conditions of Sale, please contact us at CustService@BluePacificSolar.com. 2.4	Temporary Interruptions. You understand and agree that temporary interruptions of the Site may occur as normal events that are out of our control. You also understand and agree that we have no control over the third-party networks or services that we may use to provide you with Offerings, Products or Kits. You agree that the Offerings, Products or Kits available on this Site are provided "AS IS" and that we assume no responsibility for the timeliness, deletion, mis-delivery or failure to store any user communications or personalization settings. 3.2	No Endorsement. Blue Pacific Solar® neither endorses nor assumes any liability for any materials uploaded or submitted by users on any part of the Site. Although we do not pre-screen, police or monitor comments posted on the Site, we and our agents reserve the right to remove any and all postings, in our sole discretion and without prior notice to you. Blue Pacific Solar® and its Agents are not responsible for any failure or delay in removing such postings. 3.3	Third-Party Sites and Information. This Site may redirect or link to other websites on the Internet, or may otherwise include references to information, products or services made available by unaffiliated third parties. While we make every effort to work with trusted, reputable providers, from time to time such sites may contain information, material or policies that some may find inappropriate or personally objectionable. You understand that we are not responsible for the accuracy, completeness, decency or legality of content hosted by third party websites, nor are we responsible for errors or omissions in any references made on those websites. The inclusion of such a link or reference is provided merely as a convenience and does not imply endorsement of, or association with the Site or party by us, or any warranty of any kind, either express or implied. 4.1	Content. For purposes of these Terms, "content" is defined as any information, communications, published works, photos, video, graphics, music, sounds, or other material that can be viewed by users on our Site and is owned by Blue Pacific Solar®, our Affiliates or licensors. 4.2	Ownership of Content. All content on the Site is: Copyright © 2015 Blue Pacific Solar® Products. All rights reserved. All content on the Site is subject to intellectual property rights, contractual or other protection. The intellectual property rights are owned by us or our licensors. No content may be copied, distributed, republished, uploaded, posted or transmitted in any way except as provided expressly in these Terms or with Blue Pacific Solar®'s prior express written consent. Any use of the content other than as permitted by these Terms, or any other unauthorized use of the content may make you liable to Blue Pacific Solar® for violation of intellectual property rights. 4.3	Trademarks. Trademarks or service marks of Blue Pacific Solar® include, but are not limited to, Blue Pacific Solar®, Blue Pacific Solar Products® and BluePacificSolar.com®. All custom graphics, icons and service names are registered trademarks, common law trademarks or service marks of Blue Pacific Solar® or our Affiliates. All other trademarks or service marks are property of their respective owners. Nothing in these Terms grants you any right to use any trademark or service mark, and/or the name of Blue Pacific Solar®, our Affiliates or our licensors. 4.4	Site Use. Blue Pacific Solar® grants you a limited, revocable, nonexclusive license to use the Site solely for your own personal purposes only and not for republication, distribution, assignment, sublicense, sale, commercial use, preparation of derivative works, or other use. You may not use any content from the Site for commercial use. You agree not to copy the Site, reverse engineer or break into the Site, or use materials, products or services in violation of any law. Any use of the Site or the content or materials contained therein, other than as specifically authorized in these Terms, without the prior written permission of Blue Pacific Solar®, is strictly prohibited and will terminate the license granted herein. Unless explicitly stated herein, nothing in these Terms shall be construed as conferring to you, whether by implication, estoppel or otherwise, any title or ownership of, or exclusive use-rights to, any intellectual property or other right and any goodwill associated therewith. Blue Pacific Solar® reserves the right, without notice and in its sole discretion, to terminate your license to use the Site at any time and to block or prevent your future access to, and use of, the Site. 4.5	No Warranty for Third-Party Infringement. Neither our Affiliates nor we warrant or represent that your use of materials displayed on, or obtained through, this Site will not infringe the rights of third parties. 5.2	We respect the intellectual property rights of others, and we ask you to do the same. In instances where we are notified of alleged infringing User Content, a decision may be made to remove access or disable access to such materials, in compliance with the safe harbor provisions of the Digital Millennium Copyright Act, 17 U.S.C. § 512(c). Notice may be sent to us at CustService@BluePacificSolar.com. 6.1	Login Required. In order to make purchases on this Site you will be asked to set up an account and password. Our account registration page requests certain personal information from you ("Registration Info"). You will have the ability to maintain and periodically update your Registration Info as you see fit. By registering, you agree that all information provided by you as Registration Info is true and accurate and that you will maintain and update this information as required in order to keep it current, complete and accurate. 6.2	Passwords & Security. If you register for an account on the Site, you agree that you are responsible for maintaining the security and confidentiality of your password and that you are fully responsible for all activities that occur under your account. Therefore, you must take reasonable steps to ensure that others do not gain access to your password and account. Our employees will never ask you for your password. 7.1	Blue Pacific Solar® relationship in the sale of any product(s) on the web site as well as any other written agreement(s), written quotes, written custom orders between us and you is that of a material supplier with limited knowledge of actual jobsite conditions. Blue Pacific Solar® does not guarantee compliance or suitability of the products it sells with any federal, state or local laws, codes or regulations, nor does Blue Pacific Solar® accept responsibility for the construction, installation and/or operation of the products after purchase. It is the sole responsibility of the Buyer to verify that the all products purchased will work for the actual installation conditions and that the products are installed and/or operate are in compliance with the various rules and regulations surrounding the installation and operation of such equipment, including but not limited to, the National Electrical Codes (NEC), Authority Having Jurisdiction (AHJ) Code Officials, Uniform Building Code (UBC) or International Building Code (IBC), Occupational Safety and Health Administration (OSHA), local utility company policies, and the instructions provided by the equipment manufacturers. These rules and regulations may vary from state to state so be sure to check with your local code officials for your local rules and requirements. You the buyer (customer) agree to do your due diligence as to all the rules and regulations mentioned above and fitness for use of the equipment you are purchasing at your location prior to making any purchase from the Site as well as any other written agreement(s), written quotes, written custom orders between us and you. 7.2 All warranties and warranty claims are between you, the buyer (customer), and the manufacture. Blue Pacific Solar® is a distributor only. Products sold by Blue Pacific Solar® are not manufactured by Blue Pacific Solar® therefore we do not warranty any of the products we sell. Consequently, Blue Pacific Solar® makes no warranties, expressed implied, at to the condition, merchantability, fitness for a particular purpose, or any other matter concerning the materials described herein and the buyer (customer) accepts the material as is by the manufacturer. Blue Pacific Solar® does not adopt or affirm any of the warranties, express or implied, including the warranties of merchantability and fitness for a particular purpose, made by any of the manufactures of any of the materials described herein. Blue Pacific Solar® bears no responsibility in sending a replacement item to the Customer in the event that they have received a defective product. If you receive a defective unit, contact the manufacturer and the manufacturer will typically repair or replace the product. 7.3 Products sold by Blue Pacific Solar® have a 30 day price protection guarantee. Customers can obtain a partial refund of the difference of the original purchase price of an item and the new purchase price of the same item if they can show that the price within 30 days after the purchase the item is on sale at a lower price for the same item at Blue Pacific Solar® on-line store. [We do NOT price match with other suppliers.] If the price of an item drops within 30 days of the original purchase price AND the claim is made within that 30 day period Blue Pacific Solar® will refund you back the difference in the prices absent tax and shipping costs. 8.1	ALL CONTENT AND Offerings, Products or Kits ON THIS SITE ARE PROVIDED ON AN "AS IS" AND "AS AVAILABLE" BASIS WITHOUT WARRANTY OF ANY KIND, EITHER EXPRESS OR IMPLIED, INCLUDING, BUT NOT LIMITED TO, THE IMPLIED WARRANTIES OF MERCHANTABILITY OR FITNESS FOR A PARTICULAR PURPOSE, OR THE WARRANTY OF NON-INFRINGEMENT. WITHOUT LIMITING THE FOREGOING, WE MAKE NO WARRANTY THAT (A) THE CONTENT, PRODUCTS OR Offerings, Products or Kits WILL MEET YOUR REQUIREMENTS, (B) THE CONTENT, Offerings, Products or Kits OR SITE WILL BE UNINTERRUPTED, TIMELY, SECURE, OR ERROR-FREE, (C) THE INFORMATION OR RESULTS THAT MAY BE OBTAINED FROM THE USE OF THE CONTENT OR Offerings, Products or Kits OFFERED WILL BE EFFECTIVE, ACCURATE OR RELIABLE, OR (D) THE QUALITY OF ANY PRODUCT OR Offerings, Products or Kits PURCHASED OR OBTAINED BY YOU FROM THE SITE, FROM US OR OUR AFFILIATES WILL MEET YOUR EXPECTATIONS OR NEEDS OR BE FREE FROM MISTAKES, ERRORS OR DEFECTS. 8.2	THIS SITE COULD INCLUDE TECHNICAL OR OTHER MISTAKES, INACCURACIES OR TYPOGRAPHICAL ERRORS. WE MAY MAKE CHANGES TO THE CONTENT AND Offerings, Products or Kits ON THIS SITE, INCLUDING THE PRICES AND DESCRIPTIONS OF ANY PRODUCTS OR Offerings, Products or Kits LISTED HEREIN, AT ANY TIME WITHOUT NOTICE TO YOU. THE CONTENT OR PRODUCT INFORMATION AVAILABLE ON THIS SITE MAY BE OUT OF DATE, AND WE MAKE NO COMMITMENT TO UPDATE SUCH CONTENT OR PRODUCT INFORMATION. THE USE OF THE Offerings, Products or Kits OR OTHER ACQUISITION OF ANY PRODUCTS, SERVICES OR Offerings, Products or Kits THROUGH THIS SITE IS DONE AT YOUR OWN DISCRETION AND RISK AND WITH YOUR AGREEMENT THAT YOU WILL BE SOLELY RESPONSIBLE FOR ANY DAMAGES YOU INCUR AS A RESULT. 8.4	SOME STATES OR JURISDICTIONS DO NOT ALLOW THE EXCLUSION OF CERTAIN WARRANTIES, SO SOME OF THE ABOVE LIMITATIONS MAY NOT APPLY TO YOU. PLEASE CONSULT THE LAWS IN YOUR JURISDICTION. 9.1 THE CALCULATION OF PHOTOVOLTAIC SYSTEM ELECTRICAL YIELDS ARE BASED ON ESTABLISHED AND GENERALLY ACCEPTED METHODOLOGY OF ESTIMATED VALUES AND MATHEMATICAL MODELS. BLUE PACIFIC SOLAR ® IS IN NO CASE LIABLE FOR THE REAL YIELD OF OUR PRODUCTS, WHICH CAN DEVIATE DUE TO INDIVIDUAL SITE CONDITIONS, CONTAMINATION, TEMPERATURE VARIATION, ACTUAL HOURS OF SUN EXPOSURE OR DIFFERENT EFFICIENCIES OF THE MODULES. IN NO EVENT SHALL WE OR OUR AFFILIATES BE LIABLE TO YOU OR ANY THIRD PARTY FOR ANY SPECIAL, PUNITIVE, INCIDENTAL, INDIRECT OR CONSEQUENTIAL DAMAGES OF ANY KIND, OR ANY DAMAGES WHATSOEVER, INCLUDING, WITHOUT LIMITATION, THOSE RESULTING FROM THE PURCAHSE OF PRODUCTS ON THE SITE; THOSE RESULTING FROM THE SHIPMENT TRANSPORTATION OR DELIVERY INCLUDING DELAYS OF THE PRODUCTS PURCHASED FROM THE SITE; THOSE RESULTING FROM THE INSTALLATION OR USE OF THE PRODUCTS PURCHASED FROM THE SITE; YOUR USE OF THE INFORMATION OR CONTENT CONTAINED ON THE SITE; OR YOUR RELIANCE UPON THE ACCURACY OF INFORMATION CONTAINED ON THE SITE, WHETHER OR NOT WE HAVE BEEN ADVISED OF THE POSSIBILITY OF SUCH DAMAGES, AND ON ANY THEORY OF LIABILITY, ARISING OUT OF OR IN CONNECTION WITH THE USE OF THIS SITE OR OF ANY WEBSITE REFERENCED OR LINKED TO FROM THIS SITE. FURTHER, WE SHALL NOT BE LIABLE IN ANY WAY FOR THIRD PARTY PROMISES REGARDING OUR PRODUCTS. SHIPMENT AND OR DELIVERY DATES ARE MERELY ESTIMATES AND FAILURE OF SHIPMENT AND OR DELIVERY BY THE ESTIMATED DATE WILL NOT CONTITUTE GROUNDS FOR CHARGE BACK, SETOFF, OR OTHER DAMAGES OR CLAIMS OF DAMAGES. IN NO EVENT SHALL BLUE PACIFIC SOLAR'S® LIABILITY TO YOU EXCEED THE PURCHASE PRICE YOU PAID FOR THE PRODUCT(S) IN DISPUTE. 9.2	You agree to defend, indemnify, and hold us and our Affiliates harmless from all liabilities, claims, and expenses, including attorneys' fees that may arise from your use or misuse of this Site or any of the content or products contained therein. We reserve the right, at our own expense, to assume the exclusive defense and control of any matter otherwise subject to indemnification by you, in which event you will cooperate with us in asserting any available defenses. 10.1	Grounds for Termination. You agree that we may, at our sole discretion, terminate or suspend your access to all or part of the Site with or without notice and for any reason, including, without limitation, breach of these Terms. Any suspected fraudulent, abusive or illegal activity may be grounds for barring your access to this Site, and reporting you to the proper authorities, if necessary. 10.2	No Right to Offerings, Products or Kits Upon Termination. Upon termination and regardless of the reason(s) motivating such termination, your right to use the Offerings, Products or Kits available on this Site will immediately cease. We shall not be liable to you or any third party for any claims for damages arising out of any termination or suspension or any other actions taken by us in connection therewith. Sections 1 and 3-11 of these Terms shall survive any termination. 11.1	International Use. Although this Site may be accessible worldwide, those who choose to access this Site from other locations do so on their own initiative and at their own risk. If you choose to access this Site from outside the United States, you are responsible for compliance with local laws in your jurisdiction, including but not limited to, the taxation of products purchased over the Internet. Any offer for any product, service, and/or information made in connection with this Site is void where prohibited. 11.2	Governing Law and Venue. This Site (excluding any Third Party websites) is controlled by us from our office in Sacramento, California, and the statutes and laws of the State of California shall be controlling, without regard to the conflicts of laws principles thereof. With respect to any claims and disputes arising under or relating to these Terms, you agree to submit to the exclusive personal jurisdiction and venue of the state or federal courts in Sacramento County, California. 11.3	Notices. All notices to Blue Pacific Solar® or BluePacificSolar.com shall be in writing and shall be sent to CustService@BluePacificSolar.com. You agree to allow us to submit notices to you using the email address provided by you in the Registration Info. Any notices or communication under these Terms will be deemed delivered to the party receiving such communication on the delivery date when transmitted by email. 11.4 Communication in General. By placing communication in writing, there is less chance of miscommunication. Henceforth, all official communication with Blue Pacific Solar® regarding warranty claims, shipping damage and or any technical question or response shall be in writing and responded to in writing by the buyer, customer or representative by email or other written means. Verbal responses are not binding and no verbal agreements or understanding will be recognized by Blue Pacific Solar®. 11.5	No Resale Right. You agree not to sell, resell, reproduce, duplicate, distribute, copy or use for any commercial purposes any portion of this Site, or use of or access to this Site or Offerings, Products or Kits provided through this Site, beyond the limited rights granted to you under Section 4 of these Terms. 11.6	Force Majeure. In addition to any excuse provided by applicable law, we shall be excused from liability for non-delivery or delay in delivery of Offerings, Products or Kits available through our Site arising from any event beyond our reasonable control, whether or not foreseeable by either party, including but not limited to: labor disturbance, war, fire, accident, adverse weather, inability to secure transportation or delays in deliveries by 3rd party freight companies beyond our control, governmental act or regulation, and other causes or events beyond our reasonable control, whether or not similar to those which are enumerated above. 11.7	Savings Clause. If any part of these Terms is held invalid or unenforceable, that portion shall be construed in a manner consistent with applicable laws to reflect, as nearly as possible, the original intentions of the parties, and the remaining portions shall remain in full force and effect. 11.8	No Waiver. Any failure by us to enforce or exercise any provision of these Terms or related rights shall not constitute a waiver of that right or provision. When you place an order with us, on line or otherwise, you are making an offer to buy merchandise and or services. We will send you an email to confirm that we have received your order. We will not take payment from you until we have accepted your order. Payment in full is due at the time of order. It is a not uncommon for manufactures to sell out their inventory for a period of time (large projects, unforeseen demand). If the merchandise that you ordered is not readily available or we have made a pricing mistake, we will advise you of this before we proceed with your order. In the event the merchandise is not available because of an unexpected stock outage or manufacture delay, we may elect to supply you with substitute merchandise of equal quality and performance or better. If the need to offer a substitute product arises, the product will always will be equal or better and we will notify you in advance, before we proceed, confirming by email that you will accept the substitute. If you choose not to accept the substitute merchandise, any charges will be reversed at no risk to you. If we have made a pricing error, your transaction will be cancelled at no risk to you. Orders will not be processed and begin the shipping cycle until after 9:00 AM Pacific Standard Time (P.S.T.) of the next business day (Monday to Friday) following placement of your order, excluding holidays and weekends. Change of day is considered to occur at midnight (12:00AM) P.S.T. All order shipments are subject to product availability and complete customer order, billing and shipping information being received by Blue Pacific Solar® as well as credit verification and authorization. Shipments are pending weather restrictions, natural disasters or delays beyond our control. Shipping times only apply from the date and time that the order was shipped. Shipping times do not include customs delays or delays caused by acts of God. For more information regarding shipments, please reference "Shipping" category. Building, Electrical Code, OSHA, Manufactures Installation Compliance. Our relationship in the sale of any equipment or material is that of a material supplier with limited knowledge of the actual jobsite condition. It is the sole responsibility of the Buyer to verify that the all products purchased will work for the actual installation conditions and that the products are installed and/or operate are in compliance with the various rules and regulations surrounding the installation and operation of such equipment, including but not limited to, the National Electrical Codes (NEC), Authority Having Jurisdiction (AHJ) Code Officials, Uniform Building Code (UBC) or International Building Code (IBC), Occupational Safety and Health Administration (OSHA), local utility company policies, and the instructions provided by the equipment manufacturers. These rules and regulations may vary from state to state so be sure to check with your local code officials for your local rules and requirements. You the buyer (customer) agree to do your due diligence as to all the rules and regulations mentioned above and fitness for use of the equipment you are purchasing at your location prior to making any purchase from the Site as well as any other written agreement(s), written quotes, written custom orders between us and you. By purchasing material, products and or services from us you the buyer (customer) acknowledge and agree you are acting as your own do-it-yourself contractor, have done your due diligence and have an understanding of the material or solar package you are purchasing and agree that Blue Pacific Solar is a material suppler only with limited knowledge of the jobsite conditions. SAFETY WARNING: Danger to life due to high voltages. Risk of death or serious injury due to electric shock. Always employ the services of a licensed local electrician or other properly trained and qualified persons to complete any final connection options prior to commissioning any electrical system. All installations should be permitted and inspected, where required, by the AHJ (Authority Having Jurisdiction (Code Officials)) in the same manner as other equivalent electrical systems. Orders Larger Than $2,000.00; Your Personal Technical Advisor. For orders larger than $2,000.00, you will be notified, usually the next business day after you place your order, of the name and contact information for your personal technical advisor that will be assigned your account. Your Technical Advisors job is to work with you throughout the process and will be the point person on your order providing you with a single contact point to help make the process easier. Your assigned Technical Advisor will take ownership of the sale and make it their personal responsibility to keep you informed and that the process of purchasing, confirming the design and answering questions through completion of installation so the process is seamless. We do not claim all our Technical Sales Consultants can answer all questions all the time. However, for the questions they cannot answer, they know where to get the answer and then get it back to you as quickly as possible. Site Security - How We Protect the Security of Your Information. Blue Pacific Solar® is serious about security and privacy guaranteed with comprehensive identity theft coverage from buySafe to safeguard your personal information. For online purchases we do not store and we do not have access to your credit card information. Your credit card transaction is secure using encrypted 256-bit technology. For all information, we use a multi-layered SSL firewall to protect against unlawful intrusion. IMPORTANT NOTE: When you order on-line through our secure checkout, your credit card details are erased from our servers and records almost instantaneously. We do not store the details of your credit card information on our servers. We are a buySAFE Bonded Merchant - What that means to you. As a buySAFE bonded merchant, it demonstrates we're committed to providing you with the ultimate peace of mind by giving you a confident and guaranteed shopping experience when you buy from us. buySAFE provides on line merchants a "bonding" service to provide you with a more confident, safe and secure on line shopping experience. When shopping on line, always look for the buySAFE Seal and enjoy the ultimate peace of mind that comes from buying from a buySAFE Merchant. We do NOT take orders, authorizations or requested changes in the specifications over the phone. It is easy for verbal orders or instructions to be misunderstood by either party. We think it is safer for both parties to make transactions in writing. You know what you are getting and there is no chance we will misunderstand your instructions. You can order on line, or we will send you a E-quote for a custom designed system. Payment Options Available at Checkout / Credit Card Charge Policy. Credit Card Charge Policy. When you order on-line through our secure checkout, your credit card or PayPal account is charged at the time of your order. We normally ship in 3 - 5 business days after your funds clear. The 1 - 2 business days allows our security team time to screen and score your order for fraud. This fraud scoring process offers both the card holder and the company a higher level of protection. By continuing with the checkout process, you agree to be bound by the company's credit card charge policy. If you do not have a history of this type of charge you may want to call your card company and tell them the charge is coming through. Often times credit card companies will decline the charge just for security reasons. Once you have the information above, you will need to go down to your local bank and tell the customer service agent you would like to do a bank wire from your account. Your local bank will have a form that you have to fill out, or you might be able to start the process online. Cashier's Check Option - We do not accept personal checks as a form of payment. The only paper checks we accept for payment is a cashier's check drawn on a USA bank or Credit Union that we can verify it's authenticity with fraud screening. If you choose to complete your purchase with the Cashier's Check Option, select check as your method of payment at checkout and you will be sent instructions on where to send the cashier's check. Blue Pacific Solar® is a Registered Trademark with the United States Patent and Trademark Office for Blue Pacific Solar Products Inc.®, a California Corporation. 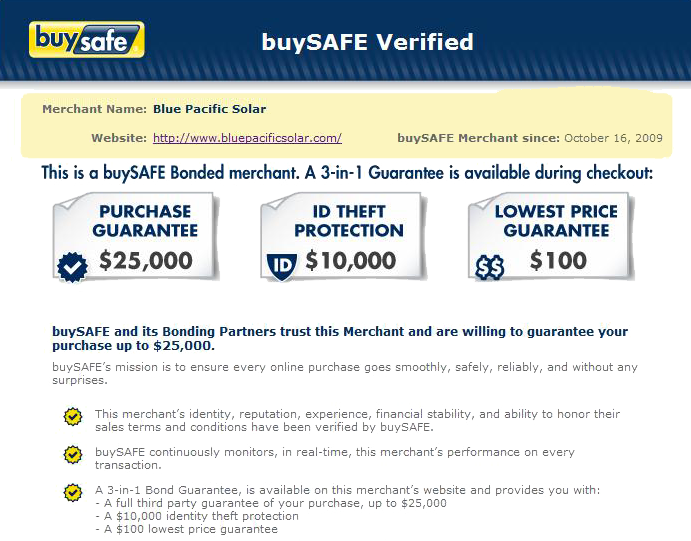 Blue Pacific Solar® has been screened and verified by PayPal, Visa, Master Card, American Express and is a verified Authorize.Net merchant. As a registered approved vendor with the US government we have been screened by the DOD (Department of Defense) and IRS. You can verify that by going to https://www.sam.gov and doing a search by either or Duns number 833262194 or our full corporate name Blue Pacific Solar Products Inc.® Our customer base includes the US Forestry service, US Coast Guard, Martin Marietta and respected state universities like Iowa State. We only select products from Best-In-Class solar manufactures with equipment that is UL / CEC (California Energy Commission) listed and approved, with the longest warranties available in the industry. Order Status - How can I check the status of my order? You will receive a confirmation by email at the time of order. When we ship your order, we will send you a tracking number via email so you can check on the progress of your order at that time with that carrier. Most freight items are shipped via UPS, FedEx or Conway LTL. After placing an order you will get a confirmation email within the first 10 min. If you place an order with Blue Pacific Solar® and don't get an confirmation email check your "junk" mail folder, it will probably be in there. The sale is contingent upon the availability of goods or product. If a product is not available for any reason, we will give you the option of waiting until it is available or gladly reverse your charges at your request at no risk or cost to you. You will only be charged tax if the shipment is going to California or HI which has an internet sales tax. Blue Pacific Solar Inc.® is required by law to charge sales tax on orders shipped to California addresses and HI which has a unique import sales tax. The sales tax is calculated and itemized during the on line ordering process. No sales tax will be applied to orders shipped to addresses in other states. Your order can only be cancelled on the same business day following placement of your order, excluding holidays and weekends without being subject to restocking charge. After 1:00 PM P.S.T., a cancellation request is considered to be late and is subject to restocking charges. We are allowed by the bank to reverse a credit card charge the same day at no charge to us. Beyond the same day, if a charge is reversed all our affiliated banks charge us a credit card fee. Special order, custom-built and non-stock items are non-cancelable and non-returnable. This includes all drop shipments from manufacturers. The shipment of order placed and paid for can be held at the request of the customer up to 60 days from the date of order. (IE: Permit Document Service Orders). Beyond 60 days order must be shipped or are subject to restocking or storage charges. Change of day is considered to occur at midnight (12:00AM) P.S.T. Cancellations must be made via email request to customersvs@bluepacificsolar.com. Conduct & Working Environment - Blue Pacific Solar® maintains a working environment that promotes mutual respect, harrassment and or hostile free work environment where the harassment creates an offensive and unpleasant working environment. Internally or externally; Blue Pacific Solar® reserves the right not to continue a relationship that violates our hostile work environment policy. If an order is canceled by the company, any payments will be refunded to the cardholder in full and we will notify the buyer using the same email address that was on the original order. Please do not refuse the delivery. Refusing delivery may result in additional freight charges. The process for reporting order discrepancies varies based on what the issue is. By following the steps laid out below, the Customer can ensure that claims are processed in the most efficient manner possible. YOU MUST INSPECT THE SHIPMENT BEFORE YOU SIGN FOR THE DELIVERY! Compare the items shipped with the Packing List included with your shipment and verify that your order has been received. After inspecting the order, immediately write a description of the item count discrepancy on the Delivery Receipt and inform the driver. If there is an overage or shortage of items, file an claim with custservice@bluepacificsolar.com and contact your assigned Solar Consultant within 24 hours of receipt. Do not wait until you start your job to verify the contents of your order. INSPECT THE PACKAGING FIRST (Pallet or Box) - Look for the following: Torn or punctured cardboard or stretch wrap, Broken or crushed corners, Broken pallet, Module stack askew or shifted on pallet, Missing the “Do Not Stack” pyramid on module pallet. Before signing for freight or other packages, it is important that you or whomever is receiving the shipment, inspect package(s) closely and note any box damage including scuffs, dents, tears, punctures or creases on the delivery receipt. READ THIS PLEASE! Damage caused by shipping or mishandling: If there is anything unusual with the package, take pictures of the outside then inspect the contents. The Customer has the right to open packages to inspect the contents to see if there is shipping damage. If the driver is unwilling to wait while the Customer inspects all their items, the Customer may mark in the delivery receipt “Concealed Damage Possible”. IMPORTANT NOTE PLEASE READ: If you have damaged or missing items, in addition to taking pictures, please write on the receiver in big words “Broken _______ or Missing ______” and make sure you have received a copy of the receiver. The receiver is part of the legal document we need to make a freight claim. If you do not writing anything on the receiver or delivery receipt and sign it without exception, you are in effect saying you received the product in good condition. That means you accepted ownership of the product and received it in good condition. Visually evident damage caused by shipping or mishandling is to be reported to the freight carrier within 24 hours. Shipping damage is the responsibility of the freight carrier, not Blue Pacific Solar®, and should always be duly noted with the freight carrier prior to accepting and signing for the product. Blue Pacific Solar® ships all shipments weighing over 100 pounds via LTL freight carrier. We use many different freight carriers to best service our customer’s geographical areas. Blue Pacific Solar® reserves the right to change freight carriers at any time without notice. Blue Pacific Solar® offers Residential Curbside with Lift-gate Service delivery; signature is required at delivery. Each customer will receive an email when the order ships and this email will contain the name of the freight carrier and a tracking number. Includes the freight driver (only 1 person) unloading the shipment from the truck with a lift-gate if that option is selected at checkout. The freight company will place the shipment as close to the curb of the destination address as possible. Once, the shipment is unloaded off of the truck it is the responsibility of the customer / buyer to inspect the shipment, sign the delivery receipt noting any damage and to move the shipment inside the delivery address. This is not a garage delivery. For residential deliveries: The Delivery appointments are made by the freight carrier. The freight carrier will be instructed to call you and schedule a delivery appointment when your order arrives to the delivery terminal. Blue Pacific Solar® is not responsible if deliveries are late or missed due to unforeseen circumstances. NOTE: IF A CUSTOMER FAILS TO RESPOND TO THE FREIGHT CARRIER'S REPEATED ATTEMPTS TO SCHEDULE THE DELIVERY IN 2 BUSINESS DAYS OR IF THE CUSTOMER CANNOT ACCEPT DELIVERY WITHIN THE SAME TIME FRAME STORAGE FEES OF UP TO $150.00 PER DAY MAY BE APPLIED. If the shipment will be returned to the warehouse and the customer will be charged all shipping charges to and from the address of delivery plus a 15% restocking fee for the shipment. These fees will be deducted from the original purchase price of the shipment prior to refund of those items that were returned. For Business deliveries: All business deliveries will be made without an appointment during normal business hours Monday through Friday. All residential and business deliveries made by LTL freight carriers are curbside and may be from a 28 foot to 48 foot tractor-trailer depending on the availability of equipment at the local terminal. If a customer’s driveway is unpaved, too steep, or the driver is concerned about safety or other shipment issues at the property or the road leading to the property is just inaccessible, the driver at his/her own discretion will deliver the shipment to the curb of the address or in rare inaccessibility cases the customer / buyer will have to make arrangements to pick up the shipment at the local freight terminal. Customers who refuse the delivery because the driver was unable to safely proceed down the road and or driveway will be charged all shipping charges to and from the address of delivery plus a 15% restocking fee for the shipment. These fees will be deducted from the original purchase price of the shipment prior to refund. Blue Pacific Solar® reserves the right to authorize a return of any freight that is found to be undeliverable where the customer, after repeated attempts, is found to be unavailable for contact. The customer will then be responsible for all shipping charges to and from the address of delivery plus a 15% restocking fee for the shipment. These fees will be deducted from the original purchase price of the shipment prior to refund. In no event shall Blue Pacific Solar or our affiliates be liable to you or any third party for any special or punitive, incidential, indirect or consequential damages of any kind or any damages whatsoever including transportation or delivery including delays. Shipment and or delivery dates are merely estimates and failure of shipment and or delivery by the estimated date will not constitute grounds for charge back, setoff, or other damages or claims of damages. Unfortunately due to the added expense of processing international shipments, Blue Pacific Solar® will only ship to your export terminal in the United States. At that point you would be responsible for exporting the shipment. Most items will ship within 3 - 5 business days after the funds clear. We ship our products using UPS, FedEx and freight companies however, we have no control over the shipment once it leaves our dock. When forces of nature or delays by a carrier's delivery of an order, we cannot guarantee the arrival date of your package. To reduce any issues caused by a late arrival of your package, especially during the winter months where weather delays are more frequent, please place your order early to allow extra time for delivery. Blue Pacific Solar® shall be excused from liability for non-delivery or delay in delivery of Offerings, Products or Kits, Products or Kits available through our Site arising from any event beyond our reasonable control, whether or not foreseeable by either party, including but not limited to: labor disturbance, war, fire, accident, adverse weather, inability to secure transportation or delays in deliveries by 3rd party freight companies beyond our control, governmental act or regulation, and other causes or events beyond our reasonable control, whether or not similar to those which are enumerated above. Custom assembled solar power centers usually ship within 10 business days (Subject to Seasonal Increases). Material Substitution - Sales are subject to manufacture availability. Solar panel manufactures occasionally will sell out their inventory of (for example), solar panels for large jobs. If this happens, we reserve the right to substitute a product of equal quality and performance or better with your prior knowledge and permission. If that material substitution is necessary. we will notify you prior to shipping your order and give you the options to either accept or decline the material substitution. If you decline the material substitution, your charge will be reversed in full at that time at no risk to you. If you accept, the order will move forward as per our normal policy. Selling out an item can happen on all items, but it is more likely to happen with solar panels. We try hard to ship in the times quoted (and faster if possible), but sometimes items are delayed beyond the stated windows. If an item is going to take longer than the original estimate, we will inform you as soon as possible to let you know what the new estimated shipping date is. Most merchandise (orders) purchased can be returned within 30 days of delivery but may be subject to a restocking charge. Note: Certain items are non-returnable, including: Power Center Builds and Custom Ordered items that are non-stocking items (Power Centers), Batteries are non-returnable, Non-stocking items that are drop shipped directly from the manufacturer, final sale items that are labeled closeout, discontinued or obsolete are non-returnable. Items that a customer seeks to return more than 30 days after purchase may not be returned for credit. (1) Orders costing less than $1,000. 100% 30 Day Money Back Guarantee. [Absent the non-returnable exception stated above.] If, for any reason, you are not happy with your on line or catalog purchase, we will accept returns and exchanges of merchandise (orders) costing less than $1,000 within 30 days of purchase when the following conditions are met. (1a) Customer is solely responsible for the cost of shipping any returned product back to Blue Pacific Solar and only after receiving a return authorization number (RAN). Customer agrees to use only reputable carriers capable of providing proof of delivery and insurance for the entire value of the shipment. Customer agrees to bear all shipping and insurance charges and all risk of loss for the return product during shipment. Customer agrees that all returned products will be 100% complete, unused and is in salable condition, and will include the original undamaged packaging material, manuals, blank warranty cards, and other accessories provided by the manufacturer. If any component of the returned product is missing, or if the product has been used, damaged or altered and can not be resold as new, the return procedure will be breached and Blue Pacific Solar® may in its sole and absolute discretion reject the entire return or choose to impose additional charges against the customer for replacement of the missing component(s). Shipping, buySafe insurance and handling charges are non-refundable, unless an error occurred on our part in shipping your order and absent a verifiable warranty condition. (2) Merchandise (orders) purchased costing more than $1,000 may also be returned within 30 days of the original purchase date but may be subject to a restocking charge. Customer may return item with shipping prepaid and insured by the customer to the address specified by Blue Pacific Solar® (address may be original manufacture); provided that Blue Pacific Solar® reserves the right, in its sole discretion, to charge a restocking charge on merchandise returned up to twenty five percent (25%) (absent a verifiable warranty issue), if the following conditions are met; (a) Product is in new condition in its original packaging and has not been damaged or modified and is in salable condition (see extended explanation 1a above), (b) items are not special order such as trackers, SunPods, and custom assembled electronics, (c) items that are special order (trackers, SunPods, mobile solar trailers, custom electronics (power centers)) may not be returned for credit and the sale of these items are final 24 hours after the funds clear. We treat our customers, vendors, and one another with fairness, respect and appreciation. If you change your mind before we have made commitments to our vendors, we have no issue with cancelling your order less fees that are charge to us. Please allow 7 - 10 business days after receipt of your returned or exchanged item for your charges to be reversed on your credit card. This gives us time to inspect the item returned, restock it and process the credit. You will receive a receipt via email from the merchant bank when the credit has been processed. All warranties and warranty claims are between you, the buyer (customer), and the manufacture. Blue Pacific Solar® is a distributor only. Products sold by Blue Pacific Solar® are not manufactured by Blue Pacific Solar® therefore we do not warranty any of the products we sell. Consequently, Blue Pacific Solar® makes no warranties, expressed implied, at to the condition, merchantability, fitness for a particular purpose, or any other matter concerning the materials described herein and the buyer (customer) accepts the material as is by the manufacturer. Blue Pacific Solar® does not adopt or affirm any of the warranties, express or implied, including the warranties of merchantability and fitness for a particular purpose, made by any of the manufactures of any of the materials described herein. Most items that we sell are covered by the original manufacturer's warranty, service, or support policy (if any). In the event that there is a technical problem that occurs with your product upon receipt or installation of your product we urge you to contact the manufacturer directly. The Customer shall be responsible for the return of any defective product to the manufacture and agrees to use only reputable carriers capable of providing proof of delivery and insurance for the value of the shipment. Blue Pacific Solar® bears no responsibility in sending a replacement item to the Customer in the event that they have received a defective product. If you receive a defective unit, contact the manufacturer and they will typically repair or replace the product. All of our equipment have exceptional warranties and received international certification, including UL, which is required for the U.S. market. We have chosen to promote and sell only products and technologies that have shown to be predictable and durable in real-world applications over time. Copy of individual manufactures warranties are available upon request. Sorry no. The administrative costs exceed the profit and liability potential so we have elected not to participate in a trade program.